In 1 Chronicles 16, after bringing the ark of the covenant into a tent and offering burnt and peace offerings, David assigned some of the Levites to thank and praise the Lord God of Israel. In verse seven, David specifically assigns Asaph and his relatives to give thanks to the Lord. Verses eight through thirty-six are titled, “A Psalm of Thanksgiving.” As we celebrate thanksgiving this week, I thought it was appropriate to look at this particular psalm. As part of worship, we are exhorted to give thanks to the Lord. We are to call upon His name and sing praises to Him. In our songs of praise, we are to sing and speak of all His wonders. We are to remember His wonderful deeds which He has done. We are to remember and give thanks to Him for His marvels and the judgments from His mouth. There is no shortage of things to give thanks about. In Psalm 103:2, David tells us to “forget none of His benefits” and he lists many things to give thanks about. John wrote that if the things which Jesus did were written in detail, the world could not contain all the books that would be written. (Jn 21:25) For us to thank the Lord for all these wonders, we have to take some time to think, reflect, ponder, and consider the works that He has done. 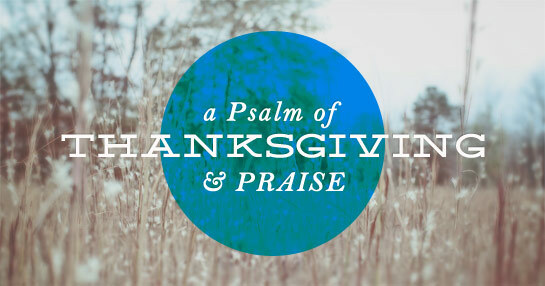 Part of our worship is coming to church prepared to give thanks to the Lord for all that He has done. Father, we want to be a church that worships You and gives thanks to You. Help us take time to reflect on all that You have done. Help us remember and not to forget any of Your benefits. May we give thanks in everything. May we live with an attitude of thanksgiving at all times, not just at Thanksgiving. I pray this in Jesus’ name. Amen. This entry was posted in Worship and tagged East Mountain Vineyard, EMV, Instruments, Joy, Praise, Psalms, Thanksgiving, Worship. Bookmark the permalink.